Writing Prompt: What Makes You Happy? I had two happiness encounters today. While shopping for office supplies, I saw a plaque that read "Make yourself so happy so that when others look at you they become happy, too." Only a couple of hours earlier I had had the experience of witnessing that quote in action. 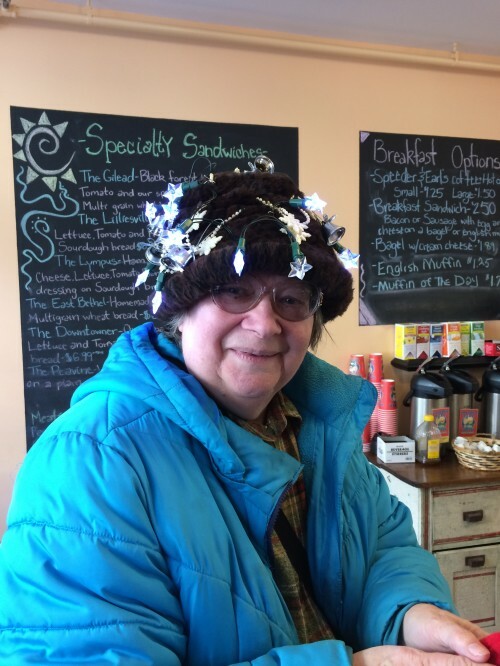 I was eating lunch at our local village sandwich shop when a woman came in wearing a hat that you just couldn't miss. It was bedecked with bells -- "only one that jingles," she shared. The rest she had tacked down so they wouldn't make too much noise. It also had an array of star-shaped Christmas lights. "Do those light up?" I asked. "Yes," she replied, if I can find the button. She proceeded to pat her head vigorously, looking for the means to turn it on. Then voila -- she lit up! And, so did I. "That's awesome!" I exclaimed. "You made me happy, thank you!" I said as I made my way to the door. "I'm glad," she said. "It's my job!" I didn't ask her what she meant, but I shut the door to the shop wearing a big smile. Job well done, I thought.